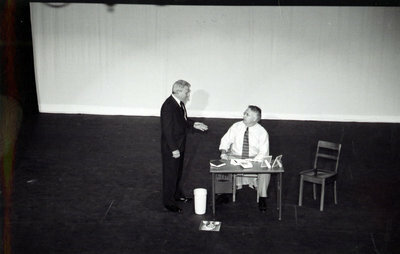 A black and white photograph of a one act play presented during the Grand Reopening Ceremony for the Centennial Building. Two gentleman can be seen on stage. In September 1964 the Ontario County Courthouse was chosen as Whitby's Canada Centennial Project to be converted into a community centre. The Whitby Centennial Building was officially opened on February 18, 1967. A three million dollar renovation was completed in 2003 to mark the building's 150th anniversary and it is now the home of the Whitby Courthouse Theatre and Whitby Brass Band. Grand Reopening of the Whitby Centennial Building, June 14, 2003, Photographer Unknown. Whitby Archives A2013_033_013.